Los Angeles is not all about Hollywood and celebrities, there is so much art to explore. 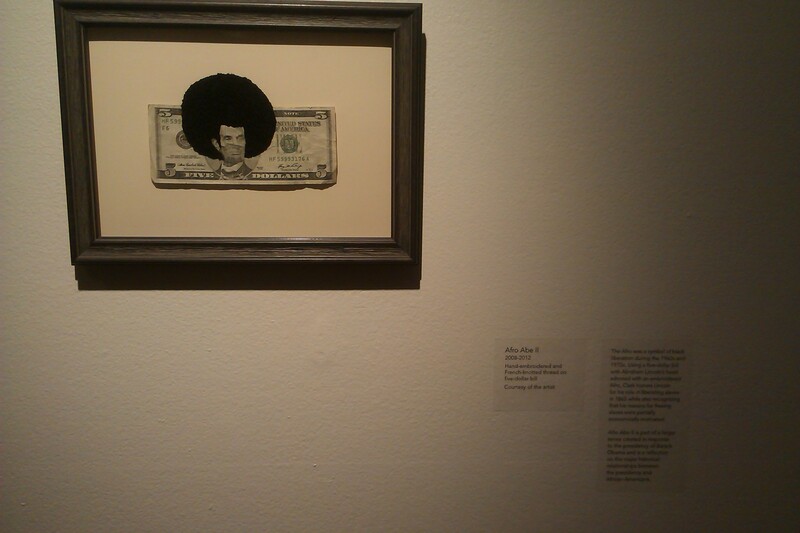 Take the Museum of Folk Art, where I met an extraordinary artist: Sonya Clark who usually works with fabric but presented an exhibition about the relation between hair and identity. This is a very close subject for me, an Italo-Congolese grown up among girls with straight-easy-to-comb hair, who at some point decided to get rid of her everlasting braids and celebrate her natural hair. I choked a “seriously?? you are wearing a wig!! !” and smiled calmly. But that told me something about the different ways people define themselves. I came to realize I didn’t need fake-straight-hair to feel better about myself. For someone who might be different, fair enough. But don’t try to tell me my Congolese roots are better or worse visible because of the style of my hair! This entry was posted on 27 June 2013 by Ngalula Beatrice Kabutakapua in Ethnic Minorities, On the road with (IN)VISIBLE CITIES, Women and tagged african hair, cultural identity, invisible cities.